Some “professional hunting associations” like the Professional Hunting Association of South Africa are now speaking out about the killing of captive bred lions. It was a close vote – only 58% of members voted against canned hunting. The final vote was 147 against and 104 for. Pressure was building against captive lion killing, and PHASA did the right thing. Now let’s see if hunting organizations like the Safari Club International, the Dallas Safari Club, the Houston Safari Club and the European hunting associations will also take a stand against captive bred lion hunting? But now let’s discuss wild lion hunting. Can we really call it hunting? 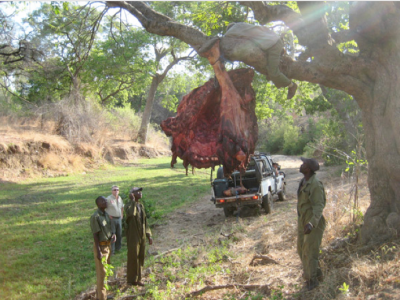 Wild lions are shot in Tanzania, Mozambique, Zimbabwe off baits. The process goes as follows. A “hunter” arrives and shoots “bait” animals. Those are placed in trees, and “trail cameras” are placed around. If the camera images reveal a big male lion responding to the bait, a blind is set up and the “hunter” installed. When the male lion returns he is blown away. Is this hunting? No. It is killing. Supposedly many wildlife authorities allow baiting, but if you read their Wildlife Acts, the hunters are breaking the law. In Tanzania, for example, it is forbidden to hunt an animal off a bait. The Tanzania Professional Hunting Association insist they have a blanket “special permit” from the director of wildlife to permit baiting for lions. If the Tanzanian wildlife director is handing out blanket permits he is operating against the law and the Tanzania Wildlife Act. Canned lion hunting is no more difficult than baited wild lion hunting. Cecil wait baited out of a nationally protected area to provide a US dentist with a trophy. Every day this same practice occurs all over the African countries that permit lion trophy hunting. Let’s all work together to prevent both sordid practices – canned lion and baited lion hunting. Making life “easy” for lion hunters via both processes is despicable.